This was published last week on Breach Bang Clear. Over a month ago, Fury was released. I watched it just after opening weekend and again last week with a French soldier I met in Afghanistan. There’s a reason I waited before writing this followup; a real review had to capture the depth of meaning I had just witnessed. Simply writing about the cinematography or acting wouldn’t do the film justice. 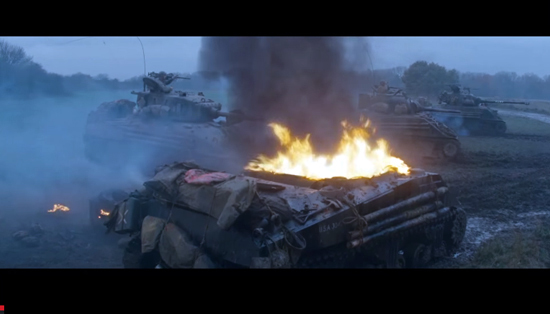 Fury wasn’t just a movie. It was a lesson, a window into the American soul, and a direct path to some of my most intense wartime memories. The movie didn’t just take me back to Iraq and Afghanistan; oddly enough, it also took me to a movie theater in Prishtina, Kosovo, in late 2000. That fall, Albanian friends took me to see a Kosovo-made movie titled Autumn of Roses. This was just a year after the NATO-led fight against Serbians to protect Albanians, and the air was still thick with the pain of war and ethnic cleansing. Autumn of Roses was the Albanian view of themselves and their enemies. While the Albanians were all perfect victims or perfect heroes, Serbs were the very archetype of evil. As a foreigner, I easily recognized the moviemaker’s appeal to cherished Albanian cultural myths. The mostly-Albanian audience, however, didn’t see what I saw. Some left the audience in tears, and I strongly suspect the movie reinforced their beliefs about both their own rightness and their enemy’s wrongness. 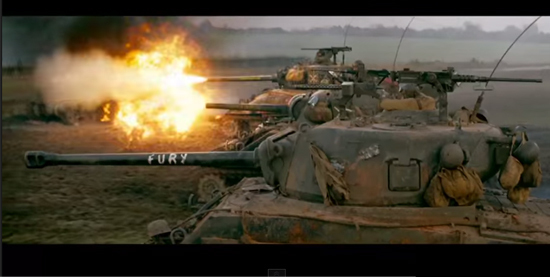 Fury accomplished the same goals for American moviegoers as Autumn of Roses did for Albanians. Like the audience in Prishtina, I doubt most of us recognize the blatant appeal to American mythology. You make some very good points, Chris. I can’t comment on the tactical aspect, although I thought it was great to see the STG-44 get a modern film treatment, ditto for the Grease Gun. One of my favorite old war films is “Battle of the Bulge” with Robert Shaw. For me, Shia Le Beouf’s character was my favorite, a man of faith struggling to hold on to his belief in God in the midst of a living Hell. As far as the SS guy getting shot in the back because he has an American coat, I think it’s a subtle reference to the Malmedy massacre, which happened just a few months before. The STG-44 was good to see, and damn I wish I could afford one. I’ve seen a .22 version for about $450, and a ways back a company made a small number of reproductions in semi-auto only. I also saw a picture of one of Moqtada Al-Sadr’s followers holding one up in Iraq. A guy I know who was in the military in the 70s said they found some that had been shipped from Europe to Africa after WW2, and rechambered to 7.62×39. When I first joined the Guard we still had M3s in my tank unit, but I never got to fire one. They were brand new. Shia’s character was one of the best, no doubt. He was definitely secure in his beliefs, proficient, and comfortable with inflicting violence. I’m not sure if the murder of the prisoner was a reference to Malmedy. American troops, especially paratroopers, were known to have killed a lot of prisoners. I’d have to look it up, but I recall reading about an American LT getting charged with murder and acquitted after ordering his men to kill 20-ish prisoners, right around the time of the Malmedy Massacre. Haven’t seen it yet. Will now. Honestly I figured that it was going to be either introspective naval gazing or a cheesy action flick. Was leaning towards the latter when I heard Pitt’s character’s name was “wardaddy”. I could have done with “Wardaddy” as well. 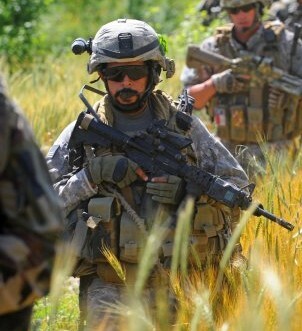 But I kind of gave it a pass, since in my old unit we called platoon sergeants “platoon daddy”. Good review, Chris. Went and read the entire review on breach, bang, clear. Dude, when Pena starts tearing down the .30, I involuntarily shuddered. I just watched it for the 3rd time. It was actually Shia that tore the gun down, but yeah, that brought back memories. As far as the prisoner killing, happened all the damn time by everyone involved. Best protection against prisoner killings are a) prisoner exchanges and b) officers that want intel from prisoners and create incentives for the troops to bring live prisoners back to the base. Human nature is not generally inclined to be very forgiving to people that just tried to kill you. I kind of wonder if a film about Soviet-Japanese fighting at Kalkin Gol/Nomonhan (50.000 or so on each side) would have a “Alien vs. Predator” appeal to a US audience btw.